On 8 December 2017, PRI’s Central Asia office was presented with a European Union award recognising PRI’s work to improve access to justice for vulnerable groups. 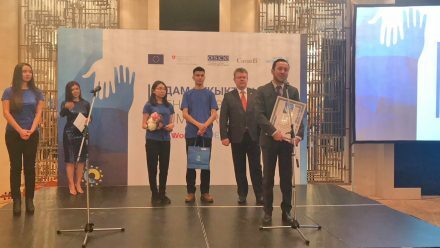 The European Union in Kazakhstan hosted an International Human Rights Award ceremony in Astana to mark International Human Rights Day, which is celebrated globally every year on 10 December, the day the United Nations General Assembly adopted the Universal Declaration of Human Rights in 1948. 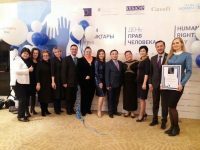 The award ceremony recognised ‘outstanding civil society organizations, which have contributed to protecting, promoting and advocating for human rights in Kazakhstan.’ Nominees were chosen by an International Community Panel in Kazakhstan. All prisoners are vulnerable to abuse from both prison staff and other prisoners. But prejudice and discrimination make some groups particularly vulnerable, and this tends to become exacerbated in closed environments such as prisons. Monitoring bodies are needed to thoroughly examine detention conditions and treatment of prisoners with specific needs. PRI’s Detention Monitoring Tool includes thematic papers which cover systemic factors that should be considered by monitoring bodies in their efforts to prevent torture. These include monitoring the treatment of particular groups, including women and sexual minorities.